Major League is a 1989 American sports comedy film produced by Chris Chesser and Irby Smith, written and directed by David S. Ward, that stars Tom Berenger, Charlie Sheen, Wesley Snipes, James Gammon, Bob Uecker, Rene Russo, and Corbin Bernsen. Made for $11 million, Major League grossed nearly $50 million in domestic release. Major League deals with the exploits of a fictionalized version of the Cleveland Indians baseball team, and spawned two sequels (Major League II and Back to the Minors), neither of which replicated the success of the original film. Former Las Vegas showgirl Rachel Phelps (Margaret Whitton) inherits the Cleveland Indians baseball team from her deceased husband. Phelps hates Cleveland and wants to relocate the team to Miami. The Indians' contract with Cleveland contains an escape clause stipulating that the team may relocate if attendance falls below a certain level. Determined to put together the worst Major League team in the country, Phelps hires Lou Brown (James Gammon), the manager for the Toledo Mud Hens, to manage the team and promotes former manager Charlie Donovan (Charles Cyphers) to general manager. During spring training in Tucson, the team's shortcomings become evident. The team's lone star, third baseman Roger Dorn (Corbin Bernsen), is an egotistical prima donna whose skills have faded. Staff ace Eddie Harris (Chelcie Ross) has to rely on illegally doctoring the baseball due to his weakening arm. Pedro Cerrano (Dennis Haysbert), a voodoo-practicing Cuban import with significant power, cannot hit breaking balls and clashes with the devoutly Christian Harris. Veteran catcher Jake Taylor (Tom Berenger), a former star turned drunk who had spent the last few years playing in the Mexican League after his knees gave out, has lost so much strength on his throws that he cannot reach second base. The two players who draw the most attention are brash young outfielder Willie Mays Hayes (Wesley Snipes), who simply showed up at spring training without an invite, and pitcher Rick Vaughn (Charlie Sheen), a convicted felon on work release from a California prison. Hayes claims he can "run like Hayes", and proves to be the fastest player on the team, and "hit like" his namesake, but is unable to hit the ball very far. Vaughn can throw a fastball well above 90 miles an hour, but has no control over it, which earns him the nickname "Wild Thing". His attitude causes him to run afoul of Dorn, who cannot stand him. The team predictably starts the season on a losing streak. Lou then discovers Vaughn's control issues stem from an uncorrected visual impairment. After being fitted with glasses, Vaughn's performance improves and the team begins to win. Meanwhile, Taylor tries to reunite with his ex-girlfriend Lynn (Rene Russo) despite her being engaged to another man. Phelps, angered by the team's improvement, tries to demoralize them by removing team amenities. She replaces their chartered team jet, first with a rickety propeller plane and then an old bus. She then refuses to fix their workout equipment, and even has the hot water to the locker room turned off. Despite her efforts the team continues to win and brings themselves into contention for the division championship. Eventually Charlie is able to reveal Phelps's plan to Lou. Lou then calls a team meeting and announces that all of the players on the current roster would be released at the end of the season no matter the outcome. With nothing to lose, Taylor says they should just focus on winning the pennant. For added motivation, they use a cardboard cutout of Phelps from her showgirl days, peeling off sections for each game they win. The team succeeds in tying the division with the New York Yankees, leading to a one-game playoff to determine the champions. However, Lou decides to start Harris in place of Vaughn due to his experience. Vaughn later ends up in bed with a woman who he later finds out is Suzanne Dorn, Roger's wife (Stacy Carroll); she had slept with Vaughn to repay her husband for being unfaithful during a victory party. In the playoff game in Cleveland, the Yankees take an early lead but Cerrano finally manages to hit a curveball and hits a home run to tie the game. The ninth inning begins with Harris loading the bases after recording two outs, with their best hitter Clu Haywood on deck. Lou decides to switch Harris out with Vaughn, believing that he's finally due. Vaughn finally manages to get his revenge on Haywood, striking him out on three straight fastballs. In the bottom of the inning, the Yankees bring out "The Duke" (Willie Mueller), their headhunting closer. The Indians manage to catch the Yankees off guard thanks to Hayes' speed after singling and stealing second base, and an unexpected bunt from Taylor to win the game. As the team celebrates, Dorn punches Vaughn in the face for what happened the night before but then quickly pulls him up so they can keep celebrating. Taylor spots Lynn in the stands, no longer wearing her engagement ring. The two rush to hug each other as the city celebrates the victory. The theatrical release's ending includes Rachel Phelps, apparently unable to move the team because of increased attendance, angry and disappointed about the team's success. An alternate ending on the "Wild Thing Edition" DVD shows a very different characterization of Phelps. Lou confronts Phelps over her plan to sabotage the team and announces his resignation. Phelps then reveals the threatened move to Miami was merely a ruse to motivate the team, as the Indians were on the verge of bankruptcy when she inherited them and she could not afford to hire star players or maintain the expensive amenities. She also tells Lou that she felt he was the right manager to bring the ragtag group together. Lou does not resign, but Phelps reasserts her authority by saying that if he shares any part of their conversation with anyone, she will fire him. This alternate ending was scrapped after test screening audiences responded negatively to the softer portrayal of Phelps. The producers actually preferred the twist ending as a resolution to the plot. The film's opening montage is a series of somber blue-collar images of the Cleveland landscape synchronized to the score of Randy Newman's "Burn On": an ode to the infamous day in Cleveland when the heavily polluted Cuyahoga River caught fire. Despite being set in Cleveland, the film was principally shot in Milwaukee because it was cheaper and the producers were unable to work around the schedules of the Cleveland Indians and Cleveland Browns. Milwaukee County Stadium, then the home of the Brewers (and three Green Bay Packers games per season), doubles as Cleveland Stadium for the film, although several exterior shots of Cleveland Stadium were used, including some aerial shots taken during an Indians game. In fact, the sign for the TV station atop the scoreboard is for WTMJ, the NBC affiliate for Milwaukee. One of the ending scenes of the movie is in West Milwaukee's legendary restaurant, 4th Base which showcases their unique horseshoe bar that is shown in the celebration scenes. Another restaurant scene, at the then Gritz Pazazz on Milwaukee's north side, is no longer open for business. Both facilities have since been demolished: the playing field of County Stadium is now a Little League baseball field known as Helfaer Field, while the rest of the former site is now a parking lot for the Brewers' new home, Miller Park; the new Cleveland Browns stadium (now FirstEnergy Stadium), a football-only facility owned by the City of Cleveland and used by the Browns, sits on the site of its predecessor. The film was notable for featuring several actors who would go on to stardom: Snipes and Russo were relative unknowns before the movie was released, while Haysbert remained best known as Pedro Cerrano until he portrayed US President David Palmer on the television series 24. The longshoreman who is occasionally seen commenting and is shown in the final celebration inside a bar is Neil Flynn, who later achieved fame playing the Janitor in Scrubs. This is Flynn's first credited movie role. The film also featured former Major League players, including 1982 American League Cy Young Award winner Pete Vuckovich as Yankees first baseman Clu Haywood, former Milwaukee Brewers pitcher Willie Mueller as the Yankees pitcher Duke Simpson, known as "The Duke", and former Los Angeles Dodgers catcher Steve Yeager as third-base coach Duke Temple. Former catcher and longtime Brewers broadcaster Bob Uecker played the Indians' broadcaster Harry Doyle. The names of several crewmembers were also used for peripheral players. The film debuted at No. 1 at the box office and received generally positive reviews. It has an 82% "fresh" rating on review website Rotten Tomatoes based on 39 reviews, with an average rating of 6.5/10. The consensus states, "Major League may be predictable and formulaic, but buoyed by the script's light, silly humor—not to mention the well-built sports action sequences and funny performances." When he joined the Cubs in 1989 (the same year the film was released), pitcher Mitch Williams' extravagant wind-up and release, and his frequent wild pitches, earned him the nickname "Wild Thing." As with Rick Vaughn's character, the Wrigley Field organist played "Wild Thing" as Williams came out of the bullpen. A few years later, in 1993 with the Phillies, Williams started wearing the number 99 on his jersey, the same number that Vaughn wears in the film. In the years since its release Major League has become a beloved film of many professional baseball players and announcers, and is often referenced during game broadcasts. For example, in 2014, for the film's 25th anniversary, Major League catcher David Ross filmed a one-man tribute to the film, with Ross playing the part (among others) of Lou Brown, Pedro Cerrano, Willie Mays Hayes, Rick Vaughn, and Roger Dorn. Additionally, as part of their 2014 "Archives" set, the trading card company Topps celebrated the film's 25th anniversary by creating baseball cards (using the same design as the company's 1989 base set) of Roger Dorn, Jake Taylor, Eddie Harris, Rachel Phelps, Rick Vaughn, and "Jobu." In 2017, the University of Arizona men's baseball team created a parody of Major League, which was filmed at UA's current home field, Hi Corbett Field in Tucson, Arizona. Hi Corbett was the spring training home for the Cleveland Indians from 1947 to 1992. The star of the short film is outfielder Matt "Mays" Frazier, who played the role of Snipes' Willie Mays Hayes character from the original film. Rick "Wild Thing" Vaughn and Roger Dorn are also parodied, and Arizona head coach Jay Johnson plays the role of Indians manager Lou Brown. Major League became an inspiration for the real Cleveland Indians and the city, given the previously long-standing Cleveland sports curse that had left Cleveland without any sporting championships in between 1964 and 2016 (when the NBA's Cleveland Cavaliers won their first title in their 46-year history). The Indians reached the 2016 World Series, but lost in heartbreaking fashion to the similarly cursed Cubs. Between 1995 and 2016, the team went to the World Series three times, though losing each time. Major League was made into and released as a sports video game, developed by Lenar and published by Irem, exclusively for the NES in Japan in 1989. Soon after the film's 25th anniversary in 2015, a company called "The Jobu Lifestyle" began producing figurines of Jobu (Pedro Cerrano's voodoo figure). The packaging is a reference to Cerrano's locker that made up Jobu's shrine. In news coverage of the 2017 World Baseball Classic, Team Israel's outfielder Cody Decker made a comparison between Jobu and the team's mascot, "Mensch on a Bench", a five-foot-tall stuffed toy that looks a bit like a rabbi or Hasidic Jew: "He’s a mascot, he’s a friend, he’s a teammate, he’s a borderline deity to our team.... He brings a lot to the table.... Every team needs their Jobu. He was ours. He had his own locker, and we even gave him offerings: Manischewitz, gelt, and gefilte fish... He is everywhere and nowhere all at once. His actual location is irrelevant because he exists in higher metaphysical planes. But he’s always near." Due to the success of the film, two sequels have been produced neither of which achieved the original's success. Major League II returned most of the original stars, with the notable exception of Wesley Snipes, and focused on the following season and the players' reaction to the previous season's success. Major League: Back to the Minors again starred Corbin Bernsen, but this time, as the owner of the Minnesota Twins, attempting to turn around the Twins' AAA team, the Buzz. 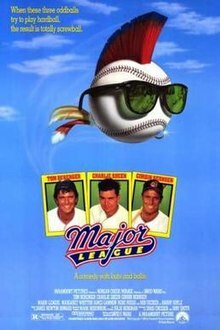 A possible third sequel, Major League 3 (which was to ignore Back to the Minors), was reported in 2010 to be in development by original writer and producer David S. Ward. Charlie Sheen, Tom Berenger, and Snipes would return, with the plot revolving around Ricky Vaughn coming out of retirement to work with a young player. In 2015, Morgan Creek Productions announced that the sequel was still in the works. In 2017, Morgan Creek announced plans to reboot their classic films from the 1980s and 1990s as television series or movies, following the success of The Exorcist television series. Several films in early stages of development include film series Young Guns, Major League, and Ace Ventura. ^ "MAJOR LEAGUE (15)". British Board of Film Classification. July 6, 1989. Retrieved August 2, 2015. ^ "boxofficemojo.com". Box Office Mojo: Major League. Retrieved May 27, 2006. ^ a b Cronin, Brian (July 20, 2010). "The film Major League originally had a dramatic twist at the end involving the team's owner". Los Angeles Times. Retrieved August 10, 2015. ^ "Major League - Wild Thing Edition". DVD Talk. Retrieved May 14, 2012. ^ Marianne Garvey (June 29, 2011). "Charlie Sheen used steroids during 'Major League'". msnbc.com. Retrieved June 29, 2011. ^ Easton, Nina J. (April 11, 1989). "WEEKEND BOX OFFICE : 'Major League' Wins Season Opener". Los Angeles Times. Retrieved May 15, 2012. ^ Thomas, Kevin (April 7, 1989). "Movie Reviews : 'Major League' in a League by Itself". Los Angeles Times. Retrieved May 14, 2012. ^ James, Caryn (April 7, 1989). "Reviews/Film; Idiocies and Idiosyncrasies Of Bungling Ballplayers". The New York Times. Retrieved May 14, 2012. ^ Corliss, Richard (April 24, 1989). "Cinema: Don't Run: One Hit, One Error". Time. Retrieved May 14, 2012. ^ ""Major League" Reviews". Rotten Tomatoes. Fandango Media. Retrieved August 11, 2018. ^ Although, according to an interview on The Dan Patrick Show (October 22, 2008), Williams' number change had nothing to do with the Major League film. Williams said he had wanted the number 99 for years because of his admiration for the football player Mark Gastineau, who also wore number 99. Williams said that he did not change his number until 1993 because that was his first chance to do it. ^ "Ross recreates 'Major League'," MLB.com (April 2, 2014). ^ "Major League 25th Anniversary Wax Pack," Topps official website. Accessed February 18, 2015. ^  "Game profile page from Gamefaqs,"] Retrieved August 30, 2016. ^ "Arizona Childhood Friends Recreate Major League's Jobu," AZ Central. Accessed April 16, 2015. ^ "There's a Company Exclusively Selling Licensed Jobu Figurines from Major League," Cleveland Scene. Accessed April 16, 2015. ^ "Israel's World Baseball Classic mascot: Mensch on a Bench," Yahoo. ^ "Israel's Mensch on the Bench mascot at World Baseball Classic," Newsday. ^ "Dutch Players Take Leave From Spring Training For World Baseball Classic," NPR. ^ "Mensch on a Bench, mascot of Israel baseball team, a hoot ahead of WBC,", The Times of Israel. ^ "Sheen returning for third 'Major League'? - Movies News". Digital Spy. June 23, 2010. Retrieved July 8, 2012. ^ Jagernauth, Kevin (September 24, 2015). "Remakes Of Ace Ventura: Pet Detective, The Exorcist, and Major League In the Works". Indiewire. Retrieved May 15, 2016. ^ Nellie Andreeva (October 26, 2017). "Morgan Creek Prods. Rebrands Itself, Plans TV & Film Reboots Of 'Young Guns', 'Ace Ventura,' 'Major League' & More". Deadline. Retrieved November 3, 2017. DVDTalk.com Review of "Major League - Wild Thing Edition"